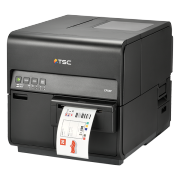 The CPX4 Series from TSC are the new ideal colour label printers for all your customers in retail, hospitality and the industry who wish to print high quality, long-wearing, full colour labels on demand. Pre-order them with us now! The colour label printers also print small labels (6 mm long) – and that at a speed of up to 300 mm per second at an excellent resolution of 1,200 x 1,200 dpi. In various designs, which are non-fading, smudge-proof and waterproof. Thus, the CPX4 Series is well suited for labelling pallets, dangerous goods containers (CLP/GHS) and for creating colour seal labels (environment, energy class). The CPX4 Series may be seamlessly integrated into existing systems and is highly economical, thanks to four separate 240 ml cartridges. Do you have questions about the CPX4 from TSC? Your sales representative will gladly assist you further! Simply call us today!